A good sunset to the naked eye, but rendered very blue by the camera’s auto white balance setting. GIVEN HOW MANY PICTURES YOU NEED TO SHOOT, over a lifetime, to develop the kind of eye that will deliver more keepers more often, you have to make peace with the taking of many, many images that do not, strictly speaking, “matter”. They’re either uninteresting or indifferently executed or mere technical exercises that don’t emotionally stick. However, that does not mean they are a waste of time, since the practice meter is running whether you’re making magic or mud. And with some mindfulness, you can get into the habit of harvesting something worth knowing, even in the most mundane of shoots. Just straying from your standard procedures in very small particulars can show you new options for shaping or salvaging a photo. In the two comparison shots seen here, there is only one thing that distinguishes the first picture from the second one; the camera’s white balance setting. Same shot, same exposure, but with a switch to the camera’s “shade” white balance setting. I just am not a fan of shooting on auto modes or default settings, for the simple reason that they are designed to produce average, not extraordinary pictures. They prevent us from making a total dog’s breakfast of an image, but they also deny everyone choice except, weirdly, the camera. On the particular shooting expedition seen here, I was seeing a warm, full-on golden hour of pre-sunset, the rich oranges and browns visible even in shade. However, the camera’s auto white balance, which reads the temperature of light to “see” white the way we do, was delivering a lot of blue. The simple switch to a “shade” setting rendered even the deepest shadows as warmly as my eyes did. The point is, this image was part of an uneventful afternoon’s casual stroll, yielding nothing in the way of “legacy”-level work. It was simple journeyman practice. What makes such tiny technical decisions valuable is how instinctual they can become when repeated over thousands of pictures, how available they become as tools when the picture does matter. Pictures come when they’re ready. With luck, building on the lessons from all those “nothing” pictures mean you’ll be ready as well. 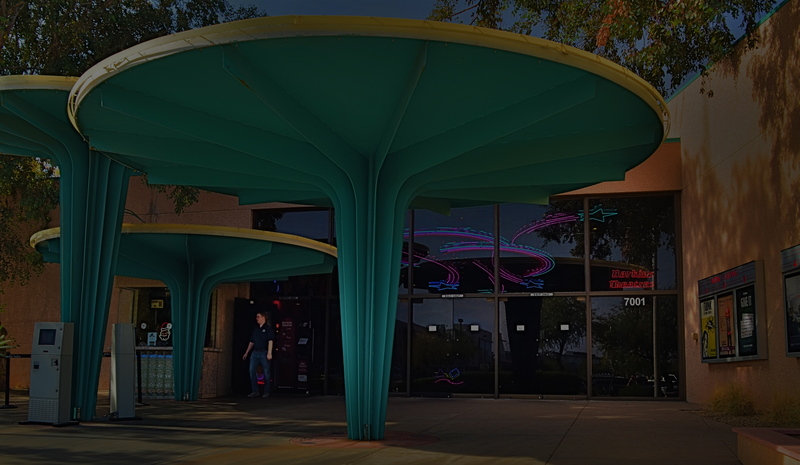 Scottsdale, Arizona’s gorgeous little art-house complex, the Camelview Theatre, on the afternoon of its final day, December 10, 2015. 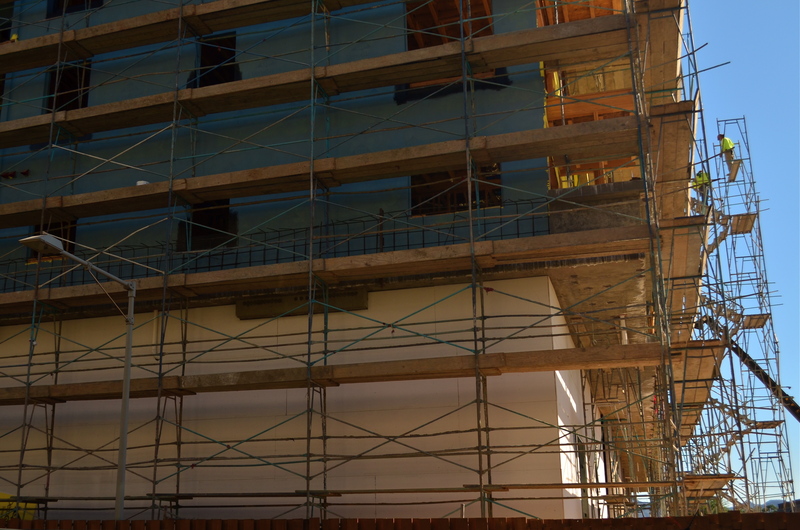 ON THE SPOCK SIDE OF OUR BRAINS, OF COURSE WE KNOW that there is nothing particularly magical about buildings per se. Stone and steel cannot, after all, generate memory or experience; they merely house the people who do. Still and all, the loss of certain edifices engenders a purely emotional response in us, perhaps because special things can no longer happen there, and the physical proof that any of it happened at all is being rendered, at least physically, into dust. That puts us in the realm of dreams, and that’s where great photographs are born. When a place that is special to us is about to wink out of existence, everyone who used that place stamps it with their own stories. We went to school here. 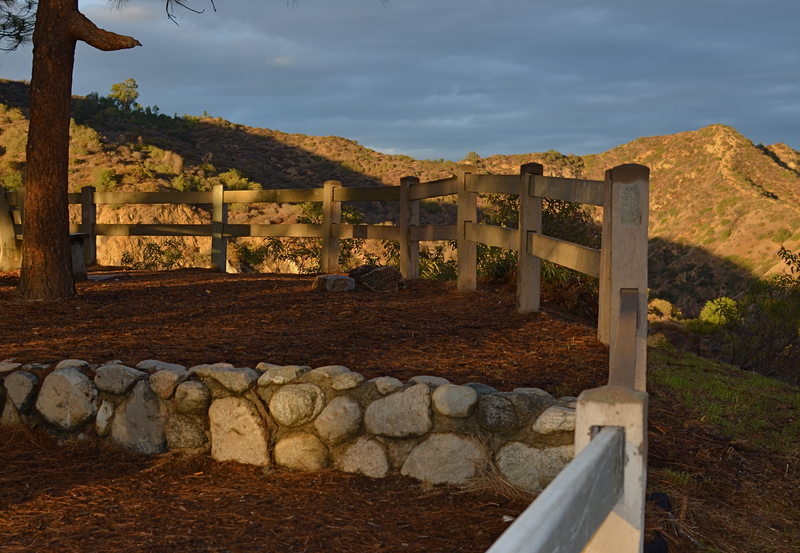 This is where I proposed to your mother. The bandstand was here, along this wall. So personal a process is this that our farewell photographs of these places can take on as many different flavors as the number of people who walked their halls. And, as a result, it’s often interesting to compare the final snaps of important places as filtered through the disparate experiences of all who come to reflect, and click, in the shadow of the wrecking ball. I have attended many an opening at theatres, but I always make a point to attend their closings. Not the end of a certain film or engagement, but the final curtain on the theatres themselves. How best to see their final acts? As a quiet, gentle sunsetting, as with the above image of Scottsdale, Arizona’s Camelview theatre, shuttering in deference to a bigger, newer version of itself at the end of 2015? Or, in the colorful confusion of the venue’s final night, with crowds of well-wishers, local dignitaries and well-wishers crowding into the final screening? 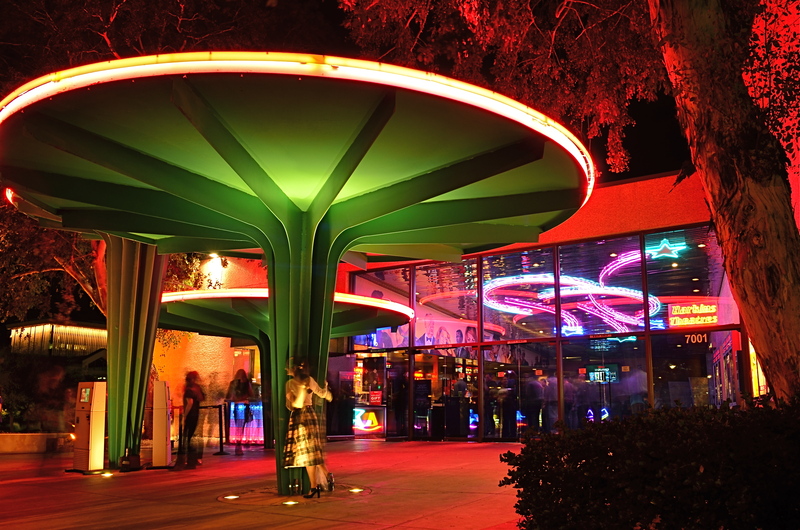 Later that same day: the Camelview’s last neon-lit night of glamour. Each view projects my own feelings onto the resulting images, whether it be a golden dusk or a frenetic, neon-drenched, tomorrow-we-die send-off, complete with champagne and cheers. The introspective daytime shot has no teeming crowds or fanfare. The night, with its ghostly guest blurs (a result of the longer exposure) features people who are as fleeting as the theatre’s own finite run. Both are real, and neither is real. But they are both mine. Buildings vanish. Styles change. 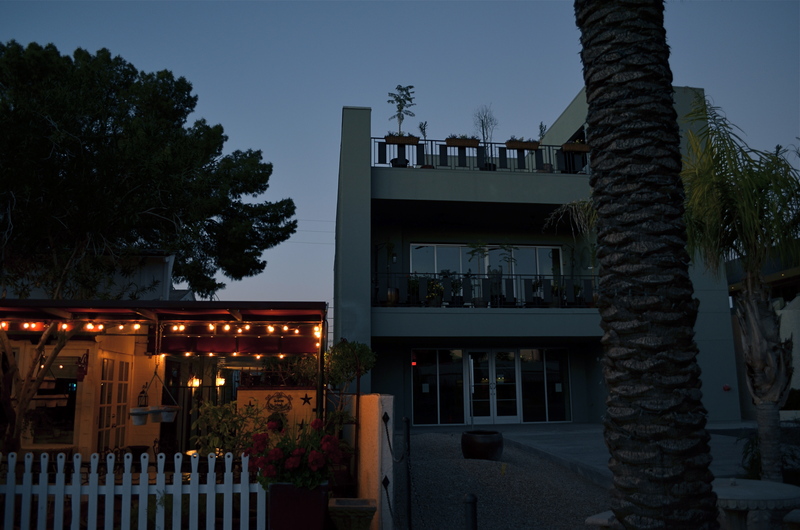 Neighborhoods evolve. And photographic goodbyes to all these processes are never as simple as a one-size-fits-all souvenir snap. People, and memories, are too customized for that. As with movies themselves, there is always more than one way to get to the final fadeout. Learning to dissect your “happy accidents” might allow you to start doing better stuff on purpose. SOMETIMES FACING OUR OWN PHOTOGRAPHIC WORK is less like dredging up memory and more like staring into the face of a complete stranger. Even seconds after the shutter snaps, a real distance widens between what we did in the moment and what we hold in our hands. Who did this? What were we thinking? Why did this work (or, in many cases, not work)? Shooting quickly on the street worsens this feeling of alienation. We might not have even been so mindful of all the factors at work in a picture while it was being made, which makes learning from both the duds and the keepers that much more difficult. Learning to completely deconstruct a shot is, therefore, one of the most valuable skills for any photographer. It’s not always an easy thing. In the above shot, there are a number of contributing factors at work, not all of them in play for any other single shot taken on the afternoon I made it. For starters, I was lucky enough to be about 200 feet above average terrain, so the golden light of early dusk is hitting the face of the church pretty hard, as well as adding to the deepening blue of the sky. 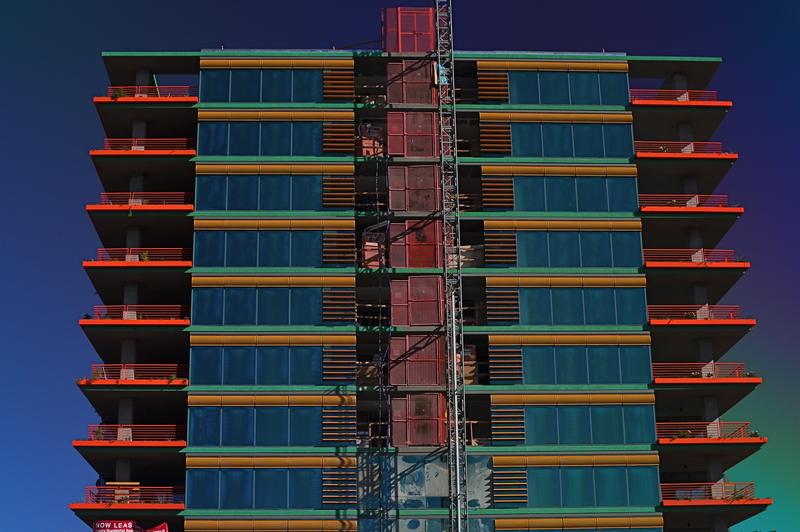 Secondly, I am shooting with my camera set on “vivid”, building even more saturation into the shot. At the same time, I am shooting through a polarizing filter, which, while not working fully at this late hour of the day, is also deepening the sky. 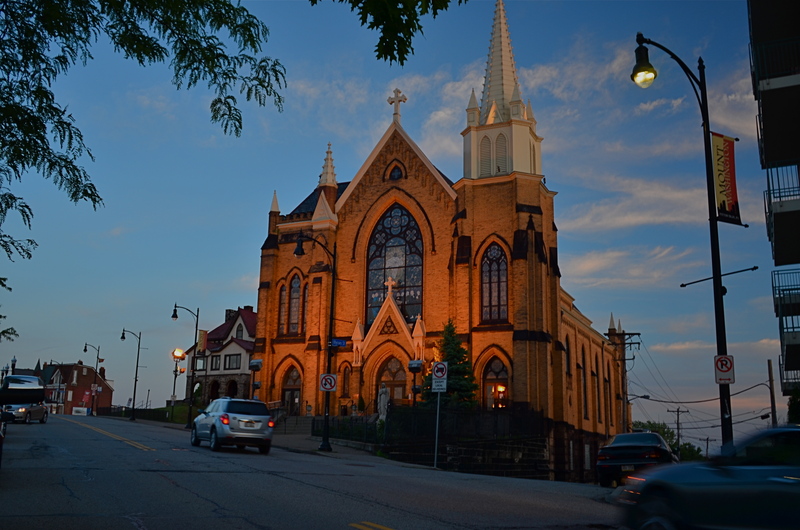 Finally, the church, which is already glowing from the sunset light, is also being floodlit with sodium lamps, amping up the orange tones and contrasting even harder against the sky. The effect is a kind of “light sandwich” four layers deep, a combo that only works for this particular shot. One or two shots later in the same sequence, these same conditions rendered the colors over-rich and pretty unreal in appearance. Sadly, I can’t even take credit for having deliberately planned the shot in this way, since, if I had, I probably would have chosen a slightly faster shutter speed and avoided the softness in the passing cars. Still, as I dissect it after the fact, it’s good practice to be able to do a post-Sherlock to see exactly what happened, in case I ever do want to manipulate a photo in this general way. Ot I could just say, “cool” and move on. And, sure, I’ve done that too. 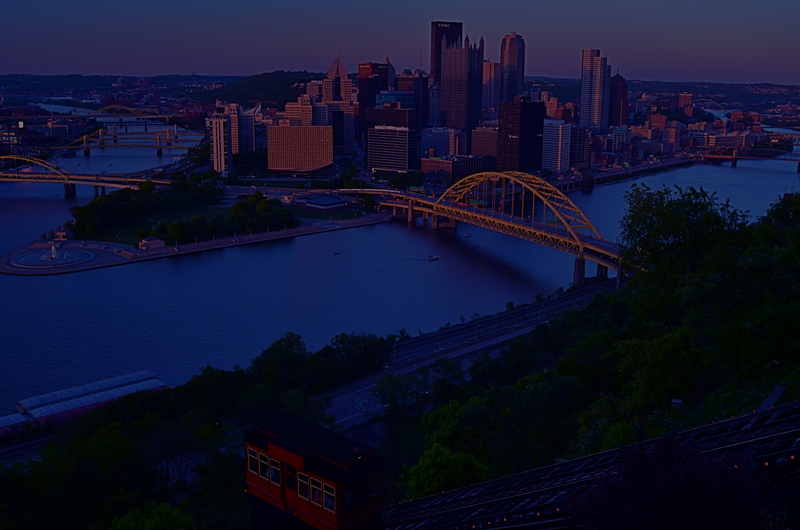 Mount Washington, the urban district that sits on a bluff overlooking downtown Pittsburgh, Pennsylvania. 1/60 sec., f/1.8. ISO 250, 24mm. IT GOES BY MANY NAMES: THE MONEY SHOT, THE GOLDEN ANGLE, THE POSTCARD VIEW. Travel enough and you will snap one. The all-roads-lead-to-this-picture, must-shoot frame that defines a town or city. Rattle off the names from Eiffel to Empire State. Drawn like moths to flame, we make the same treks that millions before us have made to capture the classic destination, the local Mecca. Do we truly believe that we, the 400,000,000th visitor to the special site, will capture something that someone else missed? Well, yes, we do. For all the other tourists, it’s just a Kodak moment, but once we focus our lens, boy, it’ll be a moment for the ages. Or not. The standard souvenir view of downtown Pittsburgh from the top of Mt. Washington. But I also believe in the value of the dead opposite of the obvious shot, the image taken 180 degrees away from the holy object we all think we must shoot. The hiding-over-my-shoulder treasure that no one came to take, but which might just qualify as a treasure hidden in plain sight. What’s across the alley from the Alamo? What’s a half a block to the left of Notre Dame? Or, in the case of Pittsburgh, Pennsylvania, what happens when you deliberately turn away from the most desired view in the city? The iconic downward vista of the Steel City, at precisely the point where the Allegheny and Monongahela Rivers blend at the town’s terminus to form the Ohio, is chiefly shot from atop Mount Washington, a district reached via the romantic, cable-driven incline service that has trucked commuters up the Mount and down for over a century. Add the souvie shop and the walk-out view platforms at the top, and it’s one of the most obvious cases of here, take this picture in all of American tourism. 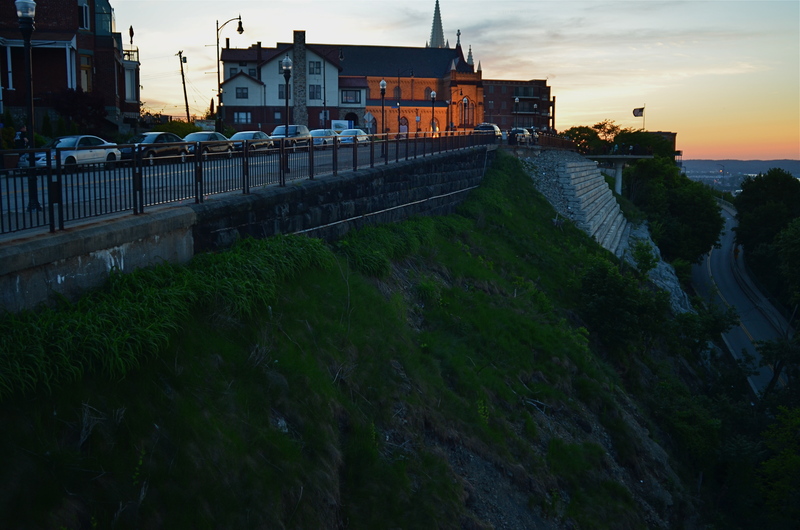 But the Mount, an old urban neighborhood unto itself, is like a flatland city dropped on top of a lumpy cliff, its streets rising and falling like a stone roller coaster. The sheer suddenness of its drop-offs and the skyward pitches of its roofs lends a zany angularity, its tiered vistas contrasted by the glass and steel of contemporary Pittsburgh just below. Think Rio with Czechs and Germans. There’s something of a religious pilgrimage quality to taking your shot at a popular attraction, but it takes mere minutes to scout around beyond the crowds to what lies immediately beyond. The opposite of obvious is often a synonym for discovery. 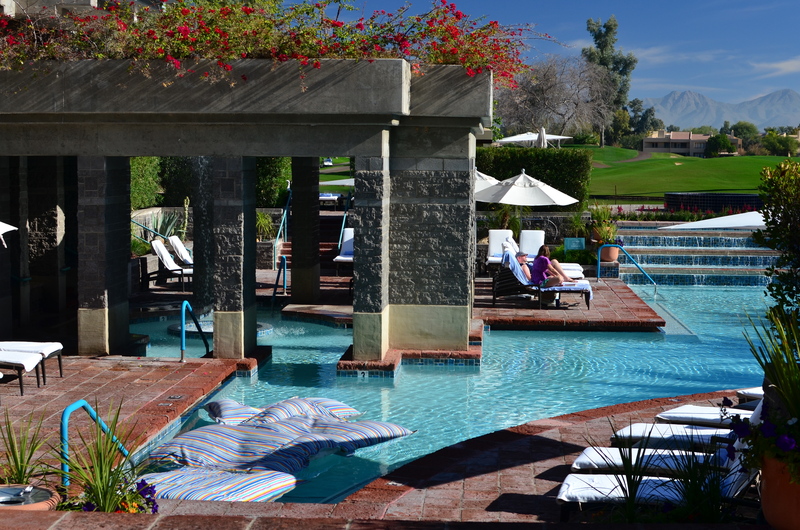 Gainey Ranch, Phoenix, 2015. 1/320 sec., f/5.6, ISO 100, 35mm. PUBLIC SPACES OFTEN LOSE THEIR POWER AS GRAND DESIGNS once they actually are occupied by the public. If you have ever leafed through books of architectural renderings, the original drawings for squares, plazas, office buildings or other mass gathering places, the elegance of their patterns is apparent in a way that they cease to be, once they are teeming with commuters or customers. This doesn’t mean that humans “spoil” the art of architecture, however, the overlay of drama and tension created by the presence of huge hordes of people definitely distracts from an appreciation of the beauty that is so clean and clear in a place’s sketch phase. Photographically, people as design objects tend to steal the scene, if you will, making public settings less dramatic in some ways. That’s why I like to make images of such locales when they are essentially empty, since it forces the eye to see design as the dominant story in the picture. I suppose that I’m channeling the great designers and illustrators that influenced me as a young would-be comic book artist. It’s a matter of emphasis. While other kids worked on rendering their superheroes’ muscles and capes correctly, I wanted to draw Metropolis right. I recently began driving to various mega-resorts in the Phoenix, Arizona area to capture scenes in either early morning or late afternoon. Some are grand in their ambition, and more than a few are plain over-the-top vulgar, but sometimes I find that just working with the buildings and landscaping as a designer might have originally imagined them can be surprising. Taking places which were meant to accommodate large gatherings of people, then extracting said people, forces the eye to align itself with the original designer’s idea without compromise. Try it, and you may also find that coming early or staying late at a public area gives you a different photographic perspective on a site. At any rate, it’s another exercise in re-seeing, or forcing yourself to visualize a familiar thing eccentrically. The North Face, 2014. 1/250 sec., f/5.6, ISO 100, 24mm. IN THE IMAGINARY PHOTOGRAPHY BOOKSHELF OF MY MIND THERE ARE HUNDREDS OF VOLUMES that speak of nothing else except the exquisite light of early morning, the so-called “golden hour” in which a certain rich warmth bathes all. You’ve read endless articles and posts on this as well, so nothing I can cite about the science or aesthetic aspects of it can add much. However, I think that there is a secondary benefit to shooting early in the day, and it speaks to human rhythm, a factor which creates opportunities for imaging every bit as vital as the quality of available light. Cities and communities don’t jolt awake in one surge: they gently creep into life, with streets gradually taking on the staging that will define that day. The first signs could be the winking on of lights, or the slow, quiet shuffle of the first shift of cleaners, washers, trimmers and delivery workers. First light brings the photographer a special relationship with the world, as he/she has a very private audience with all the gears that will soon whirr and buzz into the overall noise of the day. You are witness to a different heartbeat of life, and the quieter pace informs your shooting choices, seeping into you in small increments like a light morning dew. You are almost literally forced to move slower, to think more deliberately, and that state always makes for better picture making. Some atmospheres, like libraries or churches, retain this feel throughout the entire day, imposing a mood of silence (or at least contemplation) that is also conducive to a better thought process for photography, but in most settings, as the day wears on, the magic wears off. Early day is a distinctly different day from the one you’ll experience after 9am. It isn’t merely about light, and, once you learn to re-tune your inner radio for it, you can find yourself going back for more. This is no mere poetic dreaminess. The more nuances you experience as a living, breathing human, the more you have to pour into your photography. Live fuller and you’ll shoot better. That’s why learning about technical things is no guarantee that you’ll ever do anything with a camera beyond a certain clinical “okay-ness”. On the other hand, we see dreamers who are a solid C+ on the tech stuff deliver A++ images because their soul is part of the workflow. ONE OF THE EASIEST THINGS ABOUT ANALYZING THOSE OF OUR SHOTS THAT FAIL is that there is usually a single, crucial element that was missing in the final effort….one tiny little hobnail, without which the entire image simply couldn’t hold together. In a portrait, it could be a wayward turn of face or hint of a smile; in a landscape it could be one element too many, moving the picture from “charming” to “busy”. The secret to greater success, then, must lie in pre-visualizing a photograph to as great a degree as possible, in knowing in advance how many puzzle pieces must click into place to make the result work. I recently attended an outdoor dance recital, during which I knew photography would be prohibited. I had just resigned myself to spend the night as a mere spectator, and was settling onto my lawn seat when some pre-show stretching exercises by the dancing company presented me with an opportunity. The available natural light in the sky had been wonderfully golden just minutes before, but, by the time the troupe took the stage and started into their poses and positions, it had grown pretty anemic. And then a stage hand gave me back that missing “puzzle piece”. Positions, Please, 2014. One light source at dusk, courtesy of a light tech rehearsing with the rehearsers. Climbing the gridwork at the right side of the stage, the techie was turning various lights on and off, trying them with gels, arcing them this way or that, devising various ways to illuminate the dancers as their director ran them through their paces. I decided to get off my blanket and hike down to the back edge of the stage, then wait for “my light” to come around in the rotation. Eventually, the stage hand turned on a combination that nearly replicated the golden light that I no longer was getting from the sky. It was single-point light, wrapping around the bodies of some dancers, making a few of them glow brilliantly, and leaving some other swaddled in shadow, reducing them to near-silhouettes. For a moment, I had everything I needed, more than would be available for the entire rest of the evening. 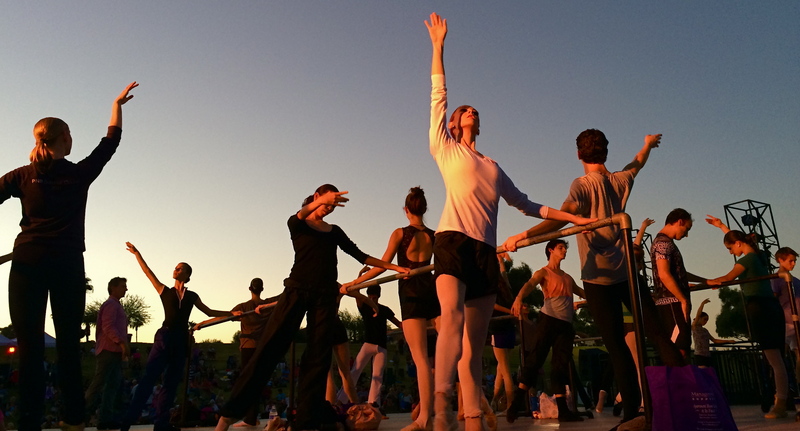 Now the physical elegance of the ballet cast was matched by the temporary drama of the faux-sunset coming from stage left. I moved in as closely as I could and started clicking away. I was shooting at something of an upward slant, so a little sky cropping was needed in the final shots, but, for about thirty seconds, someone else had given me the perfect key light, the missing puzzle piece. If I could find that stage hand, I’d buy her a few rounds. The win really couldn’t have happened without her. Going, Going: Dusk giveth you gifts, but it taketh them away pretty fast, too. 1/40 sec., f/3.5, ISO 200, 18mm. VOLUMES HAVE BEEN WRITTEN ABOUT THE WONDROUS PHENOMENON OF “GOLDEN HOUR“, that miraculous daily window of time between late afternoon and early evening when shadows grow long and colors grow deep and rich. And nearly all authors on the subject, whatever their other comments, reiterate the same advice: stay loose and stay ready. Golden hour light changes so quickly that anything that you are shooting will be vastly different within a few moments, with its own quirky demands for exposure and contrast. Basic rule: if you’re thinking about making a picture of an effect of atmosphere, do it now. This is especially true if you are on foot, all alone in an area, packing only one camera with one lens. Waiting means losing. The refraction of light through clouds, the angle of the sun as it speeds toward the horizon, the arrangement between glowing bright and super-dark….all these variables are shifting constantly, and you will lose if you snooze. It’s not a time for meditative patience. It’s a time for reactivity. I start dusk “walkarounds” when all light still looks relatively normal, if a bit richer. It gives me just a little extra time to get a quick look at shots that may, suddenly, evolve into something. Sometimes, as in the frame above, I will like a very contrasty scene, and have to shoot it whether it’s perfect or not. It will not get better, and will almost certainly get worse. As it is, in this shot, I have already lost some detail in the front of the building on the right, and the lighted garden restaurant on the left is a little warmer than I’d like, but the shot will be completely beyond reach in just a few minutes, so in this case, I’m for squeezing off a few variations on what’s in front of me. I’ve been pleasantly surprised more than once after getting back home. What’s fun about this particular subject is that one half of the frame looks cold, dead, “closed” if you will, while there is life and energy on the left. No real story beyond that, but that can sometimes be enough. 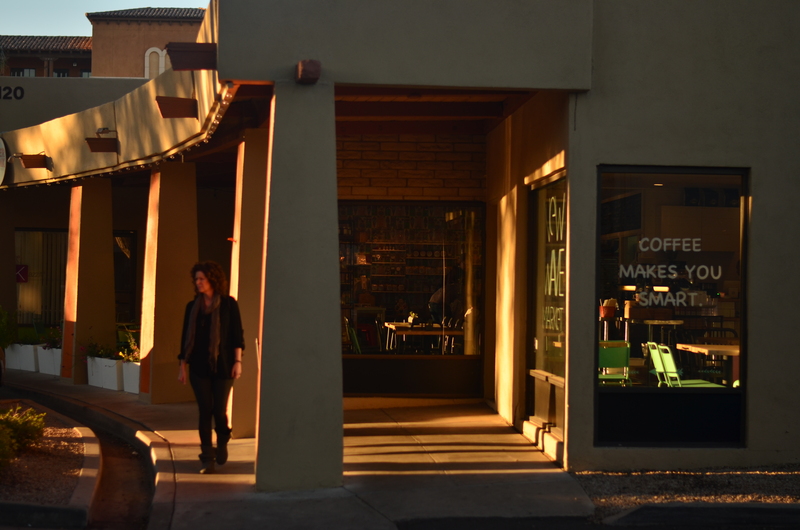 Golden hour will often give you transitory goodies, with its more dramatic colors lending a little more heft to things. I can’t see anything about this scene that would be as intriguing in broad daylight, but here, the hues give you a little magic. Golden hour is a little like shooting basketballs at Chuck E. Cheese. You have less time than you’d like to be accurate, and you may or may not get enough tickets for a round of Skee-Ball. 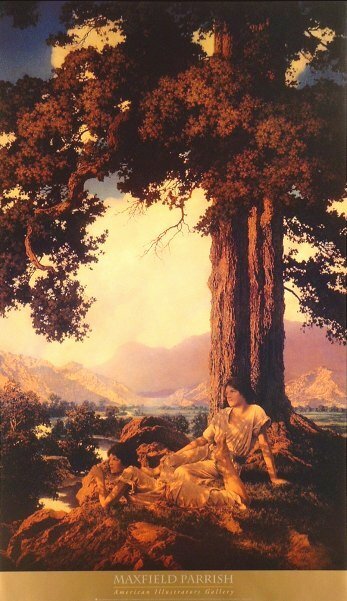 Beyond reality: the mood lighting of magazine illustrator par excellence Maxfield Parrish. THERE WAS A BRIEF MOMENT, WHEN PHOTOGRAPHY WAS A NOVELTY, when it was thought to be in some kind of winner-take-all death match with painting. That fake war lasted but a moment, and the two arts have fed (and fed upon) each other to varying degrees ever since. Both painting and photography have passed through phases where they were consciously or unconsciously emulating each other, and I dare say that all photographers have at least a few painter’s genes in their DNA. The two traditions just have too much to offer to live apart. One of my favorite examples of “light sculpting”, the artistic manipulation of illumination for maximum mood, came to me not from a photographer, but from one of the finest illustrators of the early twentieth century. Maxfield Parrish (1870-1966) began his career as a painter/illustrator for fanciful fiction from Mother Goose to The Arabian Nights. Then, as color processes for periodicals became more sophisticated after 1900, he seamlessly morphed into one of the era’s premier magazine artists, working mostly for ad agencies, and most famously for his series of magnificently warm light fantasies for Edison Mazda light bulbs. During a recent trip to the high walking paths that crown Griffith Park in Los Angeles, I saw the trees and hills, at near sunset, form the perfect radiated glow of one of Parrish’s dusks. Timing was crucial: I was almost too late to catch the full effect, as shadows were lengthening and the overhanging tree near my cliffside lookout were beginning to get too shadowy. I hoped tha,t by stepping back just beyond the effective range of my on-board flash, I could fill in the front of the fence, allowing the light to decay and darken as it went back toward the tree. Too close and it would be a total blowout. Too far back, and everything near at hand would be too dark to complement the color of the sky and the hills. Faux-Parrish with a little help from fill flash. 1/160 sec., f/5.6, ISO 100, 35mm. After a few quick adjustments, I had popped enough color back into the foreground to make a nice authentic fake. For a moment, I was on one of Parrish’s mountain vistas, lacking only the goddesses and vestal virgins to make the scene complete. You’d think that, this close to Hollywood, you could get Central Casting to send over a few extras. In togas.